This is another sample of the work of all four artists who will be showing at MMContemporArt's exhibition in Grantchester on 24th - 25th November. I hope you will be able to join us and see more of the wonderful work on show. 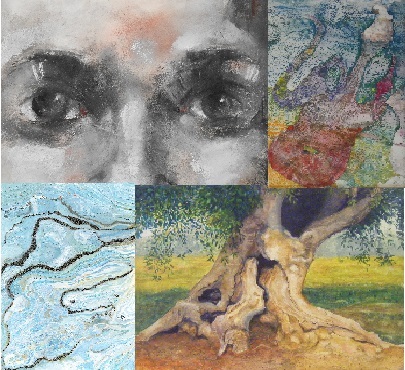 Clockwise from top left: 'Freya' by Christine Lafon, 'Instrumental Variation' by Audrey Bowling, 'Olive Tree' by Caroline Dewar and 'Anglesea Rock' by Megan Ecclestone.